Those in the business of recruiting know how tough it is to find a candidate with the right combination of qualification and skill set for the required job. Then it trickles down to compromise either on the qualification or on the skill set. When you find a candidate with the right skill set he will be under qualified in terms of education. If a candidate has the right qualification and has no perfect skill set, then you are left to train the candidates and make them worth for the job. Of course, this means that there are costs involved, but then you need to find the right balance somewhere. Or else you fear that hiring him may lower down the standards that your company has built over a period of time. Purple Squirrels – Do they really exist? The perfect candidate exists, but they are very rare to find. They remain elusive that it becomes quite a task to search for them. And they are called ‘Purple Squirrels’. Who exactly are the Purple Squirrels? Purple squirrels are the perfect fit to a job and it is the dream of every company to get hold of some. They are very hard to hunt and when you chance upon one they are very tough to be lured into your company. Candidates who have the perfect educational qualification and skill sets and would fit the precise job description are called the purple squirrels. And why is it tough to find the purple squirrels? It is tough to find the purple squirrel because they are passive candidates. It may happen that they are already employed in some other organization but may be looking out for some other challenging option. These candidates are usually the old school types and may not be regular with their resume updates also. They are the elusive ones who do not apply to each and every company for a job. Instead they have a few options in mind and are ready to seek job only in companies where they think they would fit in. That exactly is the catch. And that precisely is the point when you should be capable enough to lure them and employ them in your company. What are the Behavioral Traits of Purple Squirrels? They are obsessed with their work. They seek challenges and will be ready to work only when something arouses their interest. Money or perks is a complete no-no to them. You offer them opportunities at work, they stay back. Or else they look out for more innovative jobs. Adaptability is an issue to them. Rather you need to get adjusted. They need things to work according to them and any interference is strictly negated. They need complete freedom if they need to be successful. If you are ready to invest in innovation and technology, then they are interested to work with you. They don’t follow the traditional methods. They have been successful because they believe in implementing new changes which are technology driven. What are the Advantages of Hiring Purple Squirrels? They are pioneers in technology and innovation. They are always seeking to implement technology in the industry so that the company can benefit from it. Their productivity is always hundred times better than the average employees. This has tremendous effect on the profits of the company. When the company profits because of purple squirrels, so will its superiority over other companies increase. When you recruit a purple squirrel and when your company gains reputation, naturally it will attract more potential candidates to seek employment in your organization. After hiring purple squirrels, your company will always be known for latest technology implementation and innovation. This not only builds the brand image but also this will make you know the importance of keeping invested in innovation and advanced technology. When you add purple squirrels to your organization it will have a positive effect on the existing workforce. They will be inspired and motivated and this will drive the company into superior productivity mode. 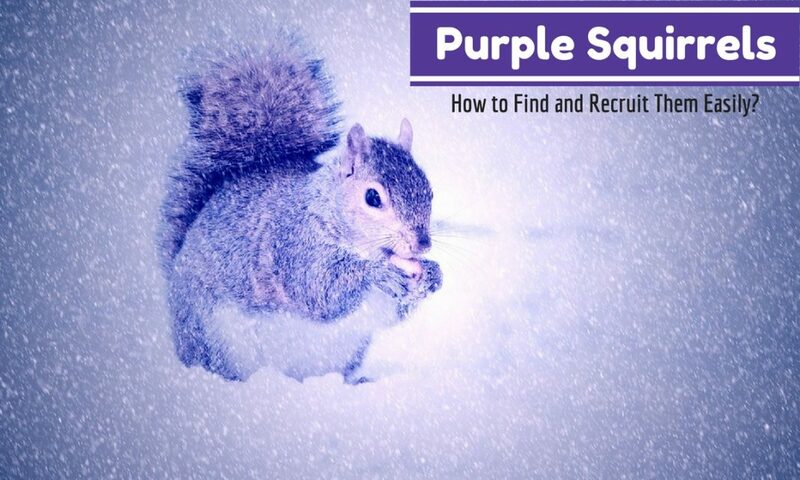 If you need to attract top performers or the purple squirrels you need to make changes in the strategies of the recruitment process. You need to focus more on building a brand and making the work culture of your organization an attractive proposition for the purple squirrels. Most necessarily you need to keep track of potential candidates when you socialize and see how they could be invited to join your company. And one more strategy is to keep hiring the best candidates even when there is no necessity because if you let go of purple squirrels once, then chances are that you wouldn’t find them again when required. What are the necessary skills that you want your candidate to possess? When you prepare a list of the skills, jot down only the necessary ones. Skills which are rarely used may be omitted. Or skills which don’t take time to learn are not a necessity. Those skills can be learnt on the job itself. When you include all the skill sets required which are optimally used then the list becomes too long and inversely your potential candidates become too less. Yes, that is what you intend to do. But you risk losing out on the purple squirrels. The best is to just list out the core competency level of skills required. The rest will just take care by itself. When you need a specialized skill set which you don’t use often, you can hire someone temporarily or it can be taught to the employee after he joins the job. Remember that purple squirrels learn fast and are very quick at grasping things. So teaching them would not be a problem at all. In fact, they learn to adapt pretty soon and learn what is required in the job itself. When you sort out the resumes don’t keep neglecting the ones who don’t have all the required skill sets. You may then miss out on the real talent. Just because a candidate doesn’t have the required degree doesn’t mean that he is not fit for the job. There are people who have had no formal education but have managed to build successful business empire. Similarly people who have had education but no skill set have learnt it all by experience and even they have been very successful in their field. So you cannot draw a line as to what is absolute necessary and what isn’t. There are instances of people who have got rejected in some top notch companies and later have made a name and become famous in their respective fields. And not to tell you how the companies might be regretting later that they missed out on their prized catch. So the inference is that not all the candidates who fit in your selection criteria are the best ones. And equally that doesn’t mean that those who don’t fit in your criteria are the unskilled ones. You need to make some effective changes in your recruitment strategy. So here comes the dilemma, when you cannot be rigid in the selection process and you need to list out only the absolute necessities then how are you going to pick up the purple squirrels from among the whole lot? For this you need to have a keen eye to select the best. Their bio-data may not be accessorized with all the fancy little skills and a hell lot of certification courses. But they are experienced and have good managing skills. And to pick out such purple squirrels it is always advisable that the senior persons of the company go through the important resumes. Since they are experienced they know which candidates may turn out to be the best picks. As a business associate you might be attending meetings and conferences. You might be meeting clients and friends. It is here that you get to know absolute efficient people and you need to keep a watch on them. Purple squirrels are innovators and they do high impact works. After you get to know them, make it a point to maintain contacts with them regularly. Use social platforms to identify such purple squirrels. You can track them on talent communities or through blogs and articles. Job alerts, emails and online searches are good tools to know the availability of such purple squirrels. Make your website more interactive. Include various tech talks, innovation communities and maintain talent networks on your website. When you include such details in your website, you naturally attract a lot of talent and you will be able to track purple squirrels through it. Making your company more attractive is important to lure the purple squirrels. What are the factors that will make your company a possible search criterion? Are there tasks challenging enough to seek employment in your company? Always keep evolving and upgrading technology in the company. Seek out new innovations and encourage employees to take up challenging roles. Build a reputation and brand that encourages candidates to seek employment. Purple squirrels are always attracted to companies who encourage innovations and where the work culture is a natural fit. Well, it doesn’t make sense to start searching for purple squirrels only when there is a vacancy in your company. Always keep an eye on the talented candidate and hire them when they are eager to move to greener pastures. If you think that you will hire them only if there is a requirement then you are completely wrong. They are long gone before you require one. They will not wait for you. They have some other opportunities waiting for them. Even when there is a vacancy in your company, if you go hunting for the purple squirrels, it is a time consuming process. First you will have to sort out the potential candidates, verify with referrals, interview them and employ the potential candidates. Even after you hire them, you would be doubtful if they exactly fit in the required category. So it is always better to immediately hire one when they are available. Recruitment agents have always emphasized on making the existing pool of employees more efficient. This way your search for the purple squirrels will not be a dire necessity. Make a yearly assessment of your staff and cherry pick the promising ones. Impart specialized training to them and make them ready for the future job. This will save a lot of time and resources spent on searching the purple squirrels. And it is easier to train the existing ones because they are already a part of your team and they fit into the work culture of your company. What happens when you recruit a purple squirrel is that you will need to make changes in the work culture to accommodate them because they are very particular about their job and they need everything according to them. So when you hire a purple squirrel you need to be accommodating and ready to make changes wherever required. This is not the case when you have to train your employees. And you never know when your trained employees may one day become the purple squirrel which you were always hunting for. When you know what are the qualities and experiences you are exactly looking for and when you are ready to accommodate and make changes wherever necessary, then you know that searching for purple squirrels will be a lot easier. Yes it is challenging, but not an impossible task. So start your search right now, remember don’t wait for it. Previous articleHow to Write an Elevator Pitch?